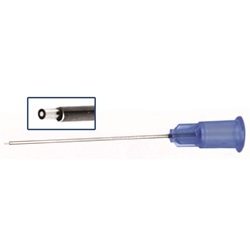 Soft tip cannulas have atraumatic silicone tip protects the retina during aspiration and subretinal fluid damage. Straight shaft, available in 23 or 25 gauge. 1mm clear silicone tip designed to maximize flow. Overall length: 50mm. 25 gauge soft tip cannula. Comes 100 per bag. 25 gauge soft tip retinal cannula. Comes 5 per box. 23 gauge soft tip retinal cannula. Comes 5 per box.